Beyond the photographers and talks at the Four X Five Photo Fest, I liked the venue. The industrial / artistic space is called East Crossing, a converted train depot in an old community within the orbit of San Antonio. There was a food truck outside and craft beer inside. It’s a far cry from convention centers and chain hotel conference rooms. The venue had a small-scale authenticity often lacking from homogenized corporate facilities. 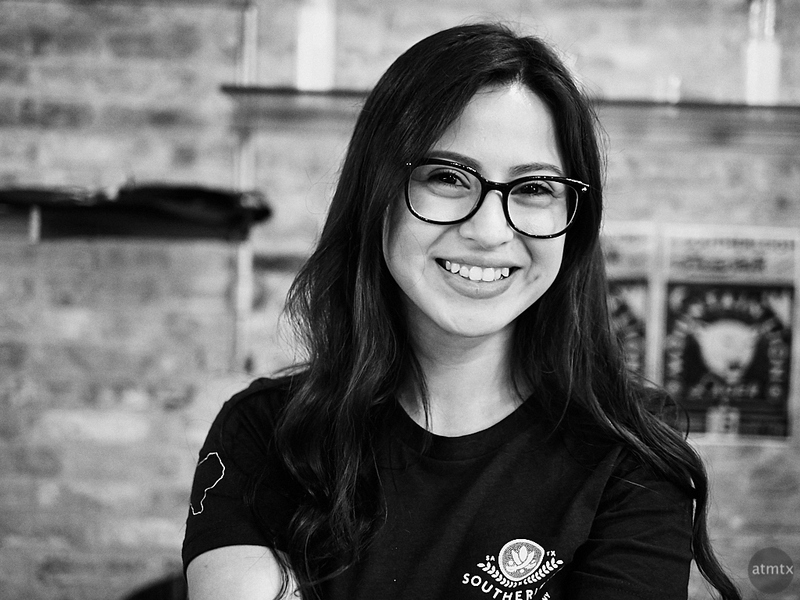 Stephanie worked at the bar, serving craft beer and soft drinks. I struck up a conversation after taking a candid of her, earlier, similar to yesterday’s post about Are you a portrait or candid person? This scene reminds of a sub-genre of black and white portraits I’ve created featuring smartphones (here and here). The irony is, those portraits were staged to look like candids. Too bad it wasn’t darker. Catching the phone’s glow — lighting up Stephanie’s face — would make the image so much better. But, unlike those staged portraits with phones, this one is a true candid. BOTH of these photos are very nice. Thank you, zdadster. I do like Jason’s mustache, however. And, the light was better. ← Are you a Portrait or Candid Person?